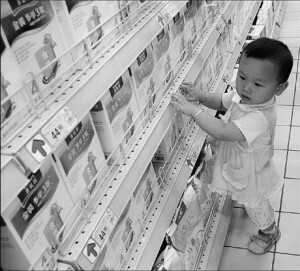 Rising disposable income and the desire to give their children the best of facilities are triggering a surge in baby-product sales among Chinese “baby boomers” – those born during or after the 1980s. Buoyed by the increased consumption, manufacturers are leaving no stone unturned to cash in on the “fourth baby boom” expected to last until 2015 and are increasingly using traditional channels and the Internet to push sales. Although the babies’ and yongsters’ products industry is still in its infancy, companies are now moving up the value chain to cash in on China’s robust economic growth. Like many other successful entrepreneurs, Hu Chao has seen the wheel turn a full circle. The agony of the initial years has been replaced by the sweet smell of success. But that was not the case 10 years ago, when Hu left a comfortable and well-paid job in Silicon Valley and decided to test the fledgling e-commerce waters in China. Thinking out of the box at that time, Hu set up a domestic e-commerce website for selling baby products. But sadly, it was a boom that was over even before it started. Her business plan of selling diapers online should have been a cakewalk for the entrepreneur. But Hu found to her frustration that most of the online netizens were youngsters without babies, while most mothers were yet to understand the finer nuances of the Web and online shopping. Since then, much water has flown under the bridge. Over the years Hu has built up a sophisticated and successful multi-channel retail model to sell maternity and baby products. The tide started turning after 2005, with nearly 16 to 18 million new babies being born every year in China. The “fourth baby boom” was at its peak in 2007 and 2008, the Year of the Pig according to the Chinese calendar and the year the Olympics were held in Beijing. Young Chinese couples believed that people born during these years would be blessed with tremendous good fortune and luck. The current baby boom is expected to last until 2015 and will see China having more than 100 million children under the age of 6 every year. In 2009 alone, 16 million babies were born, bringing the number of children aged 6 and under to around 170 million, with 70 million of these from the cities. According to the National Bureau of Statistics, nearly 30 percent of the total expenditure of urban families is on infants or children. With most of the Chinese families adopting a “4+2+1” pattern, the annual spend on a child by the extended family has also increased considerably. The “4+2+1 family” refers to four grandparents, two parents and a child. That in turn, has helped push revenues for baby and childcare-product manufacturers. According to a report from Boston Consulting Group, the market value of China’s baby industry alone – including food, garments, toys and related products – was around 130 billion yuan ($19.7 billion) in 2009 with an annual growth rate of 17 percent until 2012. By 2005, the annual revenue of Leyou Dakang Technology Inc, the company set up by Hu and her husband Gong Dingyu, a former executive with Microsoft China, crossed the 100 million yuan mark. Leyou is now one of China’s largest specialty retailers, selling more than 10,000 different products, including maternity dresses, diapers, milk powder, nursing bottles, toys and clothes. The company sells seven categories of products from 530 suppliers in 23 countries. Leyou now owns about 140 stores spread across seven cities in northern China including Beijing, Tianjin, Shenyang and Xi’an. For Leyou, the decision to shift its marketing focus from online to offline sales has proved to be lucky as the dotcom downturn of 2001 led to the closure of many e-commerce companies. In March 2001, Leyou took the first offline step by opening a store at Jiaodaokou in Beijing. Until then there were no specialty baby-product chain stores in China and most of the products were sold in supermarkets and department stores. “The specialty chain store concept is more competitive especially in terms of price. Due to the centralized purchasing and the presence of an online platform, prices at Leyou stores are 10 to 15 percent lower than other channels,” said Hu. The specialty stores also offer better services. “For instance, if a mother comes to buy baby food, our shop assistants will recommend an appropriate product according to the age of the baby,” Hu said. According to Hu, when the average annual income of a family exceeds $7,000 (5,182 euros), specialty chain stores for certain commodities or services will have their market and competitiveness. To access more remote areas, Leyou launched a service in 2004 to integrate its network, catalogue and stores. Hu said the three channels can complement each other and reach a wider audience. While the website and catalogue can attract more customers, the stores act as a platform to promote new brands and new products. Currently Leyou’s stores contribute about 70 percent of sales, with the remaining 30 percent coming from the website and catalogue. Leyou’s current gross margin stands at around 20 percent, partly because new brands are bringing in higher profits through the three channels. “Despite the immense potential, there is also pressure due to intense competition,” Hu said. Many companies, including several original baby product manufacturers, are taking aim at the profitable retailing market. The Jiangsu-based baby stroller maker Goodbaby Group is now the largest supplier of strollers in North America, Europe and China. After more than 20 years of global business, Goodbaby has a 40 percent share of the baby carriage market in the United States and an 80 percent share in China. Enthused by the current baby boom, the company has been increasing its brand building efforts in China. The company entered the retailing business in 2006 with a shop in Xizang Zhonglu, Shanghai. At present, it has 16 mother- and baby-product stores in China. The Taiwan-based Les Enphants Co Ltd, which makes and sells children’s clothes, sportswear and accessories under the Les Enphants and Petit Chou brands, entered the mainland market in 1993. It is also an authorized sales distributor for mid- and high-end brands such as Disney Baby, OshKosh B’gosh and Nike Junior. But the real star for the company is the Les Enphants brand, which occupies the top slot in the retail market for children’s apparel. The company’s mainland business accounted for more than 64 percent of total revenues in 2009, and rose to 65 percent last year. It now owns around 1,500 stores in China and plans to add another 300 more outlets this year. Enthused by the surging demand, most of the companies are now planning public floats on bourses. On Nov 24, 2010, Goodbaby International Holdings Ltd, a subsidiary of Goodbaby Group, was listed on the Hong Kong stock exchange. The share price of the company surged 18.36 percent on the first trading day, underscoring the strong demand for its products. The company is expecting double-digit growth during the first quarter. Leyou also has a listing agenda. Hu says the company will list its shares on the New York Stock Exchange or the Nasdaq over the next 12 to 18 months. The share listing will help the company raise funds for future expansion. In July 2007, seven years after its first investment, Leyou received a cash injection of $11 million from AsiaVest Partners. Later, it received a third round of investment totaling $37 million from AsiaVest Partners and Deutsche Bank, making it the largest investment recipient in China’s baby-product industry.